On Tuesday afternoon 5 August, Erik Wahlen talked about the transverse instability of generalized solitary waves (gSWs). 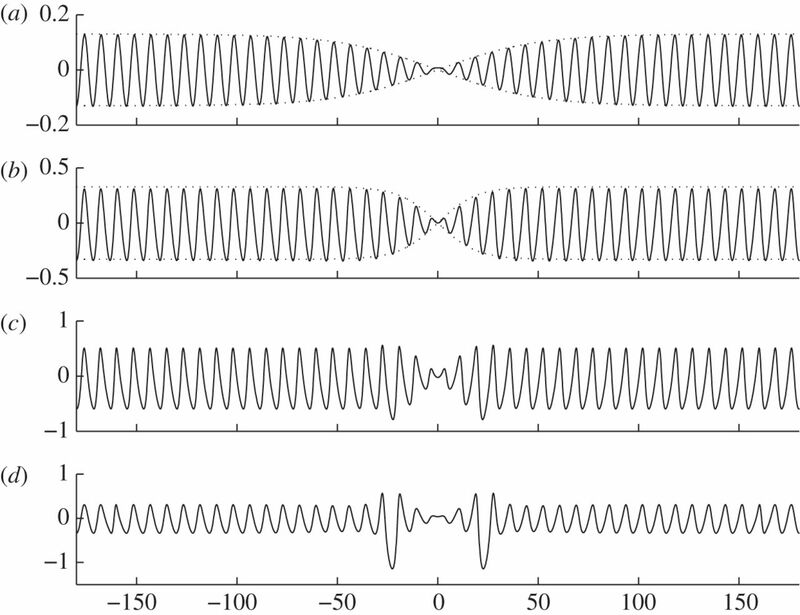 gSWs are periodic with finite-amplitude tails at infinity, and localized variation in the middle. The principal model was a 6th-order KP equation which reduces to 5th-order KdV (Kawahara) in one space dimension. The parameter range of interest was Froude number near unity, and Bond number positive and near 1/3. He first recalled the result of Haragus & Scheel (2006) which proved spectral stability of periodic solutions of the Kawahara equation to one-dimensional perturbations. Then showed that they are unstable to transverse perturbations. In the linearization about gSWs this instability shows up as unstable essential spectrum. Hence the principal result is the gSWs are unstable as solutions of the 6th-order KP equation. In work in progress, a proof is being developed for instability of gSWs for the full water-wave problem using spatial dynamics in the transverse direction. This project is joint work with Mariana Haragus. A video of the talk is here.